First cut a 6" x 9 1/2" piece of gray card stock and fold it in half for the base, a 4 1/2" x 5 3/4" piece of light blue card stock for the middle layer and a 4 1/4" x 5 1/2" piece of white for the front layer. Next stamp the hardwood background with Stampin' Up! 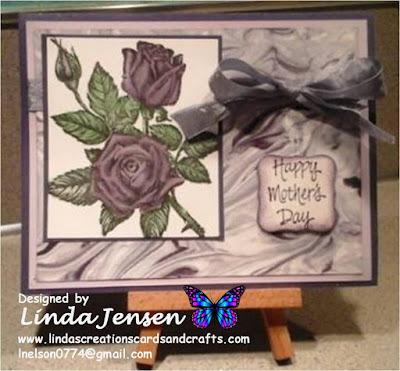 Smoky Slate ink then using a Stamp a ma jig stamp the vines in Stampin' Up! Pear Pizzaz ink. Then stamp the flowers on a piece of scrap paper in Stampin' Up! Melon Mambo ink, cut them out, then attach them to the background with mini pop dots. Next cut the sentiment out of white card stock with a Spellbinders Labels Four die, sponge the edges with Melon Mambo ink, using a Stamp a ma jig stamp the sentiment in Melon Mambo ink, attach a flower with a mini pop dot then attach it to the background with mini pop dots. 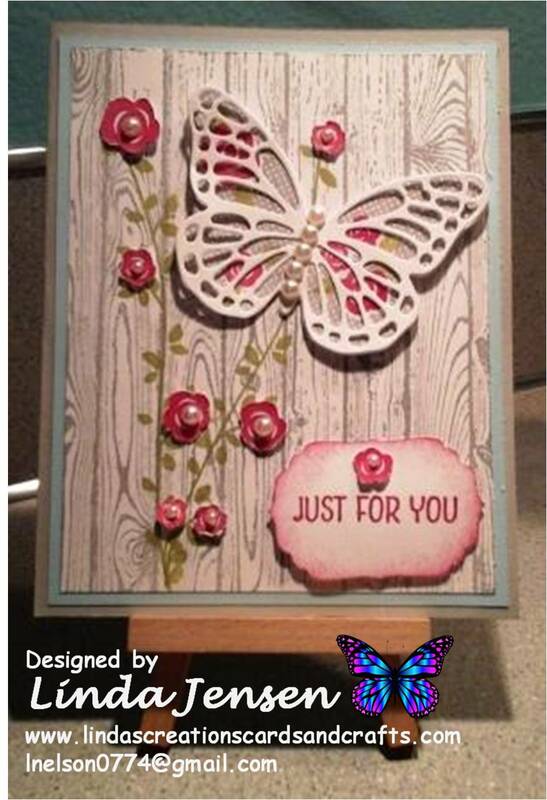 Then stamp the butterfly in Smoky Slate ink, next using a Stamp a ma jig stamp the flowers on the butterfly in Melon Mambo ink then cut out the butterfly with a Butterfly Framelits die. Next cut the top butterfly out of white card stock with a Stampin' Up! Butterflies Thinlits die, attach it to the gray butterfly with glue then attach the gray butterfly to the card front with mini pop dots. Next attach the self-adhesive pearls, finish assembling the card and enjoy!